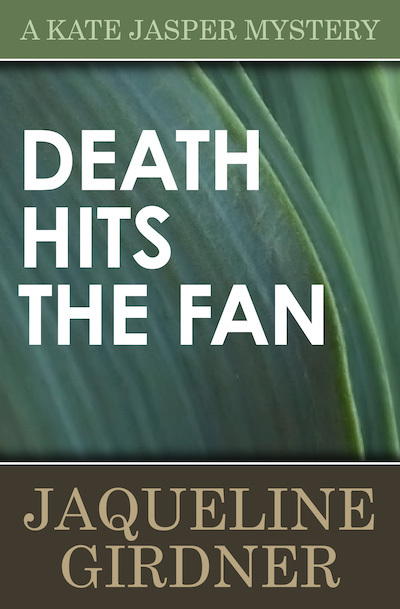 Kate Jasper, Marin County, California’s own organically grown amateur sleuth, returns in this ninth mystery in the series. Kate and her sweetie visit Ivan Nakagawa’s bookstore for an author signing in Death Hits the Fan. The event features three authors and only a few more audience members, but the small audience does not stop Yvette Cassell from reading on and on as fellow author S. X. (Shayla) Greenfree’s eyelids droop and she slumps forward. Kate is shocked by Shayla’s novel approach to boredom. But it turns out that Shayla is not just dozing, she is dead. Is the murderer’s unique signature the bracelet that Shayla snapped on before falling over? The police read an accusation into Shayla’s last utterance of “Kate, I . . . ” before Shayla slumped. But Kate did not even know Shayla. Or did she? The handwriting is on the wall. Can Kate read it before the murderer plots a sequel?